Cook variety of healthy and tasty dishes simultaneously by stacking. Reheat leftover food in pressure cookers, and avoid the microwave. Make cheesecakes without using non-stick pans. Store cooked and leftover food in refrigerator. 1. Aozita inserts are dishwasher safe but hand drying is recommended for a spotless shine. 2. Do not use steel wool, bleach or strong abrasive cleaners. If you decide to hand-wash your inserts, use mild detergents and warm water. 3. Whether you are washing your inserts by hand or in the dishwasher, it is important to dry it promptly so that spotting, streaking, discoloration, or corrosion does not occur. Versatile - Two tiers stackable containers to cook different foods in the separate containers at the same time, great for pot-in-pot cooking, preserve the nutrients and vitamins, such as steaming rice, vegetables, cornbread, stuffing, meat or fish. It can be used as a dessert pan to make cheesecakes or make lasagna. It's also great for a quick re-heat of leftovers without the microwave oven. 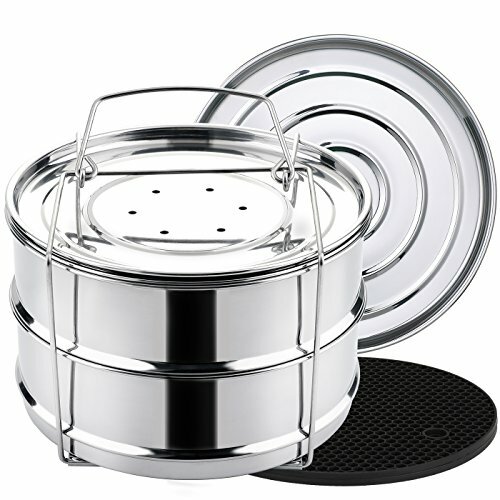 Two Interchangeable Lids for Multi-functionality - The steaming lid is designed with holes to steam vegetables, rice, meat or fish. The air-tight lid is perfect for bake, cooking, re-heating food or storage. Premium Quality - Insert pans made from18/8 stainless steel to ensure your health is not compromised, stable and highly resistant to corrosion. solid handle allows for safe and easy insertion and removal. Dishwasher safe for no-hassle cleanup. Fits 5, 6 & 8 Quart Pressure Cooker - This stainless steel cooker insert is a must have accessory for any brand and type, 5/6/8 quart stovetop pressure cooker or electric pressure cooker. Fits IP-duo50, IP-duo60, IP-lux60, IP-duo80. Also fits other multi 6 quart and above pressure cookers such as Kuhn Rikon, Power XL, Mealthy, Cuisinart, Fagor, Costaway, Faberware, T-fal, Elite, GoWise, Secura, Gourmia. 100% MONEY BACK GUARANTEE and RISK FREE PURCHASE: We have confidence in our products. If for any reason, the product doesn't fit your needs, we provide a full refund.